There are many guns available on the market, both for sport, home defense, and concealment, and it might be a bit overwhelming when you’re new to concealment to know how to chose the best weapon for everyday carry. If you are not fortunate enough to buy several guns or holsters for sport and hobby and have to choose one weapon to carry with you daily, you’ll want to choose wisely. You’ll also need a holster system that works both with your weapon of choice and lifestyle. Keep in mind that what works for someone else for concealment might not work for you. Everyone’s body, skill, and lifestyle is different, so don’t just take someone’s advice online for what a good concealment weapon is and buy it without taking into account whether or not it’s right for you. Here are four principles the NRA recommends for determining the right concealment weapon, and set-up, for you. Obviously, this is the first principle of a successful concealment system. Your holster and weapon should be able to be carried on your person in a manner that is easy to conceal, that no one who wasn’t carefully scrutinizing you would be able to notice. And this is more than just in the mirror; your weapon should be safely concealed as you move around throughout the day and not just if you stand in a certain position with your gut sucked in, but as you sit, stand, walk, etc. 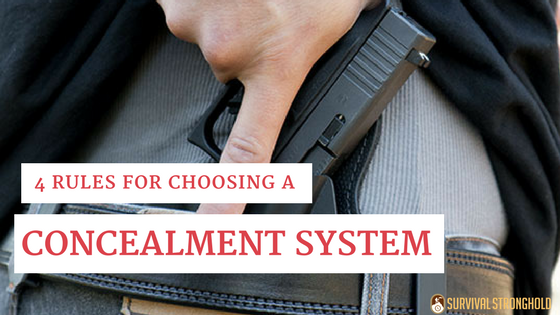 You will probably find yourself choosing to leave your weapon at home if you don’t have a comfortable concealment system. Choose a holster that fits properly and isn’t a bother to wear, and a weapon that isn’t too heavy or bulky when properly holstered. Your properly concealed, comfortably holstered weapon will be of no use to you if you can’t also easily access it when you need it. There are many holsters on the market, especially for women, that offer clever concealment that you’d have to literally reach up into your shirt to draw, and that could, in certain situations, be life-threatening if you typically wear blouses or tops that would make it difficult to access your weapon, for example. You should be able to draw your weapon quickly and discreetly. Finally, a holster needs to keep your weapon in place. You can buy special custom inserts that mold specially to your weapon, for example, that will keep it in place as you go about your day. If you can afford it, these are highly recommended by the NRA, but whatever holster you choose, it needs to keep your gun securely in place, both on your body and in the holster. Carrying a weapon is not just for fun, it is a life-saving tool that needs to be taken seriously. 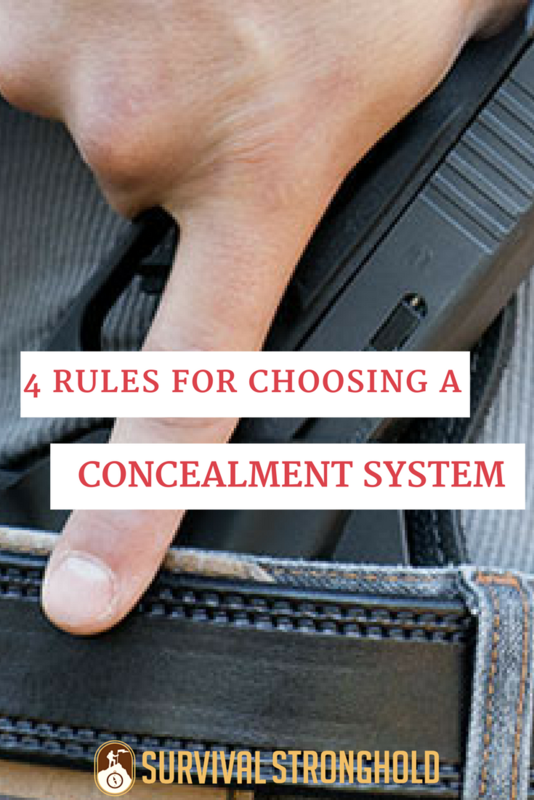 Use these four principles when choosing your concealment system as a matter of best practice.